This was part of the opening remarks of former President, Ratu Epeli Nailatikau in Parliament this morning after being elected as the new Speaker of Parliament. 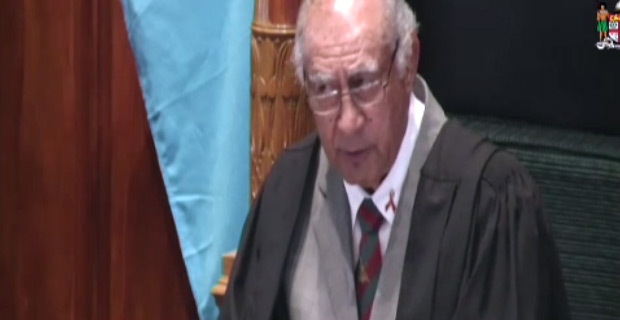 Ratu Epeli who was nominated by Government was elected as Speaker after getting 30 votes. Opposition’s nominee, Tanya Waqanika got 21 votes. After reading out his official statement, Ratu Epeli went on to explain to the parliamentarians about the process of being asked to be the Speaker of Parliament. Ratu Epeli says it is not an easy process and he has gone through it twice. He also shared the story about how he was asked to be the Speaker during the Qarase government. Ratu Epeli says he did not have any idea that he will be asked to be the Speaker then as he had just accompanied his wife who was to be sworn in as the senator and he happened to be in the public gallery. Ratu Epeli then told the parliamentarians that for this time around, he was approached by a third party and later spoke to the Prime Minister. Meanwhile, a minute of silence was also observed in Parliament this morning for the late Speaker of Parliament Dr Jiko Luveni. Parliament will resume at 2.30pm today. New Speaker @fijiparliament Hon. Ratu Epeli Nailatikau inside his office after being elected during this morning's Parliament sitting.